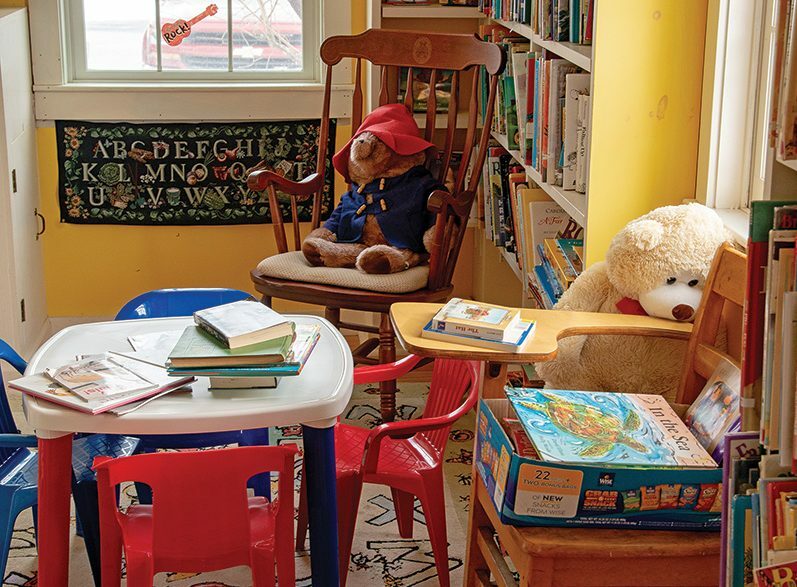 The Winhall Memorial Library in Bondville is a mere 800 square feet, but, more often than not, it’s buzzing with literary-minded patrons, while hosting myriad activities every month. So, we had to ask: How does so much action squeeze into such a small space? It’s the dining room for community lunch. It’s the studio for T’ai Chi class. It’s a gallery for local artists. It’s the meeting place for support groups. It’s where the Cookbook Club gathers, eats, and shares tips and recipes. This past December, it was the cookie swap spot. It’s a local Food Shelf drop-off site. It’s home to the town’s book club. Sometimes, it’s a movie house. And, at its core, it’s a respectable and up-to-date lending library, stocked nearly floor to ceiling with New York Times best sellers, as well as excellent nonfiction and reference books. And, add to that an impressive audio book collection and an ever-expanding DVD shelf. One of the delights of going to the Winhall Memorial Library is just walking up to the front door—the pathway is laid with four, flat stone slabs, an often-overlooked reminder that at one time in our past, men bravely quarried elephantine stones like these off Vermont’s mountainsides for just such purposes. Inside the door is a short, narrow hallway with a big bulletin board and built-in shelves filled with used books for sale. The end of the hall suddenly opens into a large, high-ceilinged room, which is both deceiving and surprising. From the outside, the historic Greek revival–style building looks so old and so tiny, but inside it gives an entirely different impression: It’s modern, bright, and airy, with every square foot of space being put to practical use. It is almost impossible to believe that the clean, well-organized stacks hold some 5,000 titles. Repairs and renovations in the 1990s included an accessible entrance, an accessible restroom, a new heating system, and new 6-over-6 windows to let in more light. Not that there wasn’t plenty of natural illumination already! A tsunami of daylight—and after dark, moonbeams—engulf the entire space through the broad wall of four, original 12-over-12 windows on the west side. It was reported, with tacit praise for a little bit of Yankee thriftiness and Vermont’s tradition of community volunteerism, that, when the library reopened in ’93, “a local woman used remnants of floral cloth to make coverings for the seat and for 15 pillows” on the long, built-in bench below the glorious 96 panes of glass. It is a feature that still provides the most enticing reading spot in the room for young and old alike. 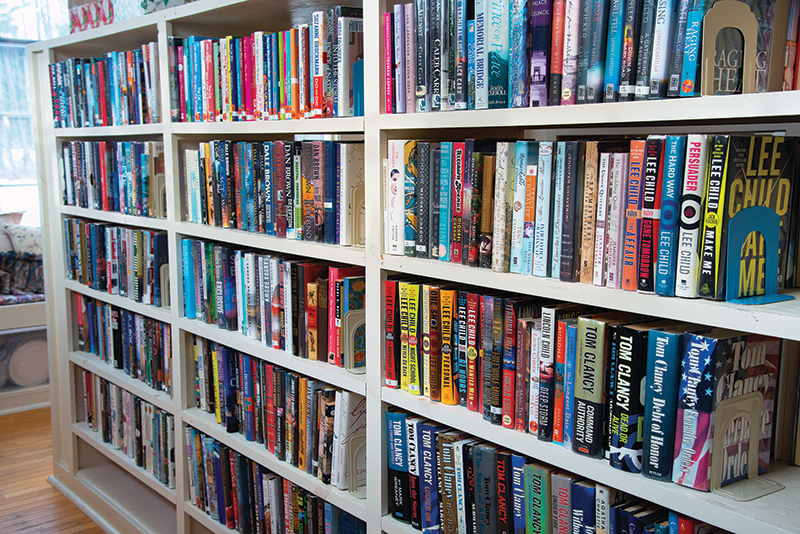 “I would have to say, although corny as it may seem, that the Winhall Memorial Library is the hub of the community,” says Librarian Dawn Santos. She says that it is a place where “people connect with neighbors and meet new residents, and, as a result, they feel involved in the community as a whole. Through our events, participants experience a greater link to the library, and simultaneously create sub-groups that directly support this library.” Santos recognizes that the ways in which people back the library takes many forms: There are those who support the idea of libraries by contributing money, but don’t predictably pop in; those who engage with the library by frequently attending events and regularly borrowing books; those who use their voting power to approve the allocation of public funds to the library; those who serve on the board of directors; those who volunteer at the library and work diligently to coordinate and host programs; and those who, without being asked, quietly do whatever they can to ensure the library will carry on. 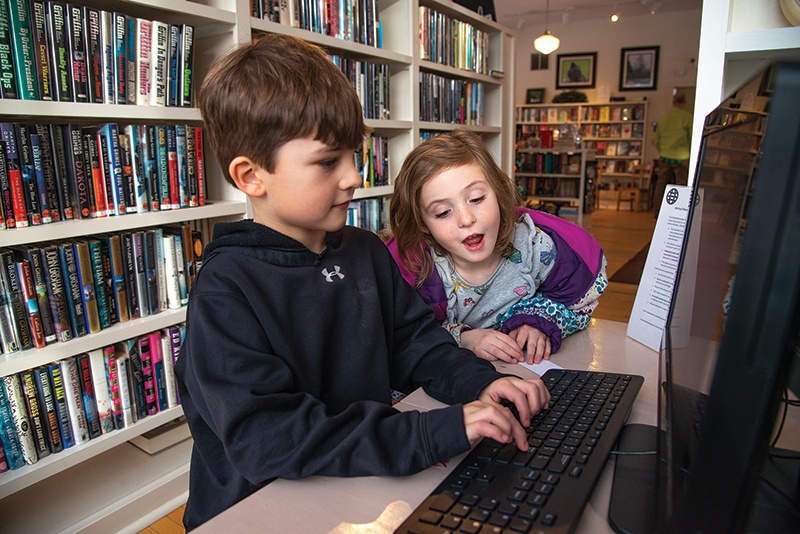 In a longstanding public-private arrangement, the town of Winhall retains ownership of the building and the property, while the library functioning within its four walls is a separate entity, operating as a nonprofit corporation managed by an all-volunteer board of directors. Santos says, “There is no book fairy that brings us free books. There is no magic wand that makes all of our supplies, event materials, and a paycheck appear. The nonprofit generously receives about 70 percent of its funding directly from town allocations from Winhall and Stratton, and the rest comes from donations, fundraising events such as our Summer Fair and Book Sale, income from a small trust given by a local family, and when possible, grants.” It is sufficient to keep the library open 12 hours a week, 12 months of the year, and Santos suggests that more cash resources, if available, would be applied to extend library hours. Board member Tami Blanchard says, “At times, I have the sense that there might be people living in Winhall who don’t even know there’s a library here, and at the same time, I feel like people don’t realize how much more the library could do with additional funds. We could buy more books, and offer more programs, but even with a small operating budget, we have always done a good job keeping our titles current. I knew of patrons who drove over here from other towns because they discovered that at Winhall they could check out the latest best sellers.” Blanchard is not only one of the library’s board members, she is also the owner and president of Homestead, one of Southern Vermont’s prominent landscaping construction and property management firms. Located across the road from the library. The company donates all the labor and materials for keeping the library grounds neat and attractive. As for the future of the Winhall Memorial Library, and all libraries, Santos’s optimistic view is that it’s long past the time for each of us to thoroughly shake off all the stereotypes we carry of what a library is—and what a librarian is. “Release it!” she says, explaining that she, like all directors nowadays, must be “dynamic and evolving.” She’s been the staff-of-one at Winhall for a little more than two and a half years, and, during that time (thanks to her academic degree in communications), people in the area have come to know more about the library than they ever have before. She has figured out how, through her colorful and cheery monthly newsletters, photo-rich webpages, and lively social media posts, to keep everyone in this rural town in touch with the library, and, through it, in touch with each other. Whether she is speaking of Winhall’s summer people, winter people, vacation people, or year-round people, Santos makes it seem as if they are all together in this cheerful room at the same time—browsing the bookshelves, practicing their p’eng jing postures, chatting about what’s new around town, riffing on movies, meeting an artist, coaching each other through life, sharing home-cooked meals, and, yes, doing what people are meant to do: relating to one another. Who knew such a small library could do so much? 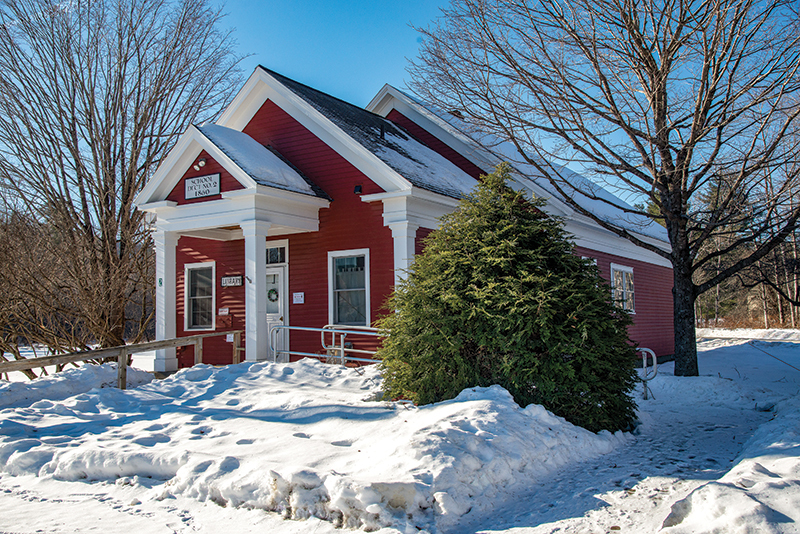 The Winhall Memorial Library building was once a little red clapboard schoolhouse, built in 1860. It sits at the triangular patch of land at the foot of Lower Taylor Hill Road, where it meets Kendall Farm Road and VT Route 30, next to a large granite tablet, the town’s memorial to veterans. For nearly a century, this was Winhall’s District #2 school, called the Grahamville School. When a new school was built in the 1950s, the Mountain Home Grange bought the building, but the town reserved the right to buy it back if the grange vacated. After the town repurchased the building in the early 1960s, the library was granted full use of the space. 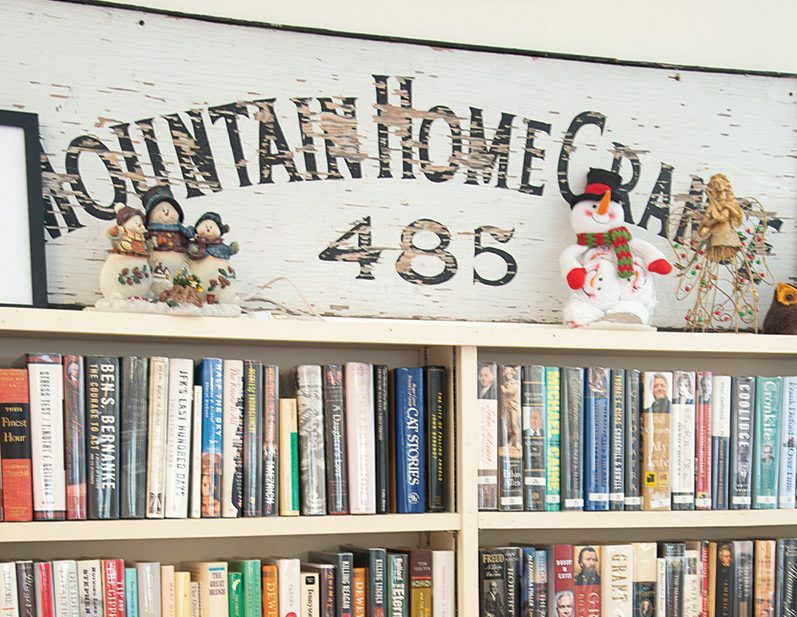 The big wooden sign for the grange is preserved inside the library now, placed high atop the tall bookshelves. In addition to its amazon.com Wish List page for books and media (it’s called the Winhall Memorial Library Wish List) where you can buy and send new books directly to them, the library keeps a shorter list of desperately needed and much-desired items. These include an outdoor storage shed for the tables and chairs used at events; newer, lighter folding tables and more comfortable folding chairs; a screen and digital projector for movie nights; and human resources—volunteers willing to inventory and automate the collection of books and media. Online, the library has a direct link to securely send contributions via their PayPal “Donate” button. Open Tuesday and Thursday from 2– 6pm and Saturday 9am–1pm. Renters, seasonal visitors, temporary residents, and year-round residents may obtain library cards.